Genesis Publications have duly published details of the Jeff Lynne's ELO limited edition book "Wembley Or Bust" (ISBN 9781905662524) after teasing fans with hints of its content in December last year. 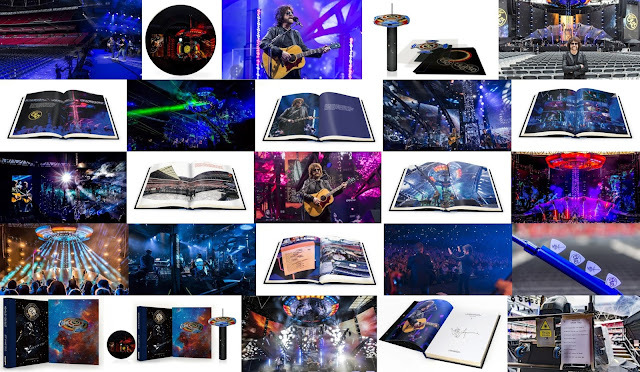 Just 1,500 copies are being published in two waves with the first 350 copies termed as the Deluxe Edition and the remaining 1,150 copies marketed as the Collectors Edition, the difference essentially being a blue (Deluxe) versus red (Collector) leather quarter binding with gilt foiling and page edging, an ELO spaceship cutout (Deluxe) and a cloth-bound Solander box (Deluxe) versus a cloth-bound slipcase (Collector). elobeatlesforever (elobf) recommends "Wembley Or Bust" by Jeff Lynne via Genesis Publications to those enlightened folks who enjoy the music of ELO, Jeff Lynne, Roy Wood, The Move, The Idle Race, 'Brum Beat', The Beatles and related artistes.